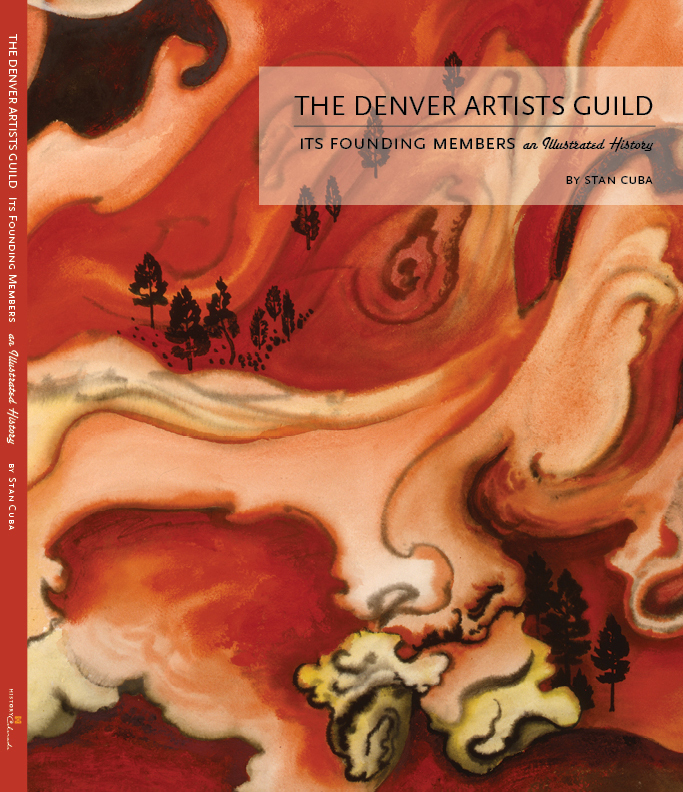 The Denver Artists Guild: How Much Do You Know About It? Barbara E. Sternberg was a member of the Denver Woman’s Press Club who in 2011 wrote the biography Anne Evans—A Pioneer in Colorado’s Cultural History. This article is reprinted with permission from the blog Sternberg developed after this book was published. Anne Evans was a resident of the present-day Center for Colorado Women’s History at the Byers-Evans House Museum, one of the statewide Community Museums of History Colorado. If you do not feel as well informed as you would like to be about the Denver Artists Guild, now is the perfect time to remedy this deficiency and have a good time in the process. Spend a few evenings reading the new book on the guild and marveling at its profuse and handsome illustrations—reproductions of the work of many of the fifty-two founders of the Denver Artists Guild. As Durham Jennings’ research efforts became more widely known, several individuals seeking information about other founding members approached her. When she realized how little was known about the guild and its members, she resolved to widen the scope of her project. She recruited two colleagues to help her in what proved to be a time-consuming and difficult task—gathering information about as many of the fifty-two founding members as was humanly possible. Many of the original members had died or moved away from Denver; some of the women had remarried and acquired new names. On the positive side, family members, when traced, often provided photographs, biographies, and locations of artwork that was photographed. All possible sources, from old scrapbooks kept by guild members to the Internet, were canvassed. The Denver Artists Guild—renamed the Colorado Artists Guild in 1990 to better describe its area of activity—is the second oldest artists’ organization in Colorado. The oldest is the Denver Art Museum, which had its origins in the Denver Artists’ Club, founded in 1893. The guild’s original membership included many of the best-known Colorado artists of the day, including Dean Babcock, Albert Bancroft, Donald and Rosa Bear, Frederic Douglas, Clarence Durham, Anne Evans, Gladys Caldwell Fisher, Laura Gilpin, Elsie Haynes, Marion Hendrie, Vance Kirkland, Waldo Love, Albert Olson, Paschal Quackenbush, Anne Van Briggle Ritter, Arnold and Louise Ronnebeck, Paul St. Gaudens, Elisabeth Spalding, David Spivak, John E. Thompson, Allen Tupper True, and Frank Vavra. In his chapter on the history of the guild, Cuba tells the story of the evolution of both the Denver Artists Guild the Denver Art Museum [DAM]. He describes how local Colorado artists were active in the DAM’s programs and played an essential role in its development. But he also makes clear that, as perhaps an inevitable result of the widening sphere of the DAM’s activities, there came a time when it could no longer fulfill the needed function of nurturing and sustaining local artists. 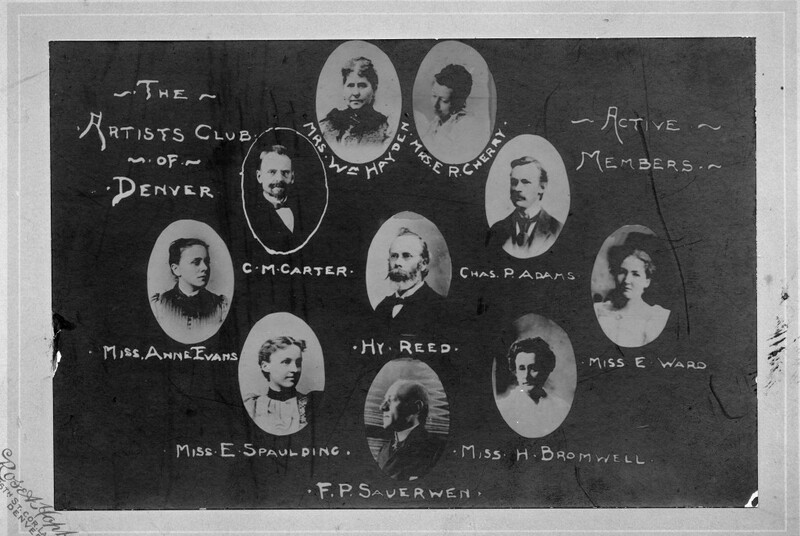 Originally the 1893 Denver Artists Club was an organization of Colorado artists dedicated both to increasing public awareness of the offerings of local artists, and to educating the public about developments in the wider world of art—nationally and internationally. The group sponsored annual juried exhibits, not only of members’ work, but also featuring well-known artists from the East and Midwest. From the beginning, the club sought associate members to augment its financial resources and to help carry out its mission in the wider Denver community. In 1917, feeling that its original name was too narrow as a description of its activities, it was renamed the Denver Art Association. The organization began to collect the beginnings of a permanent art collection, which, until 1922, had to be displayed in galleries of the Museum of Natural History in City Park. In that year, a huge boost in the fortunes of the [Denver] Art Association came with the donation to it of Chappell House, a large mansion at 1300 Logan. Though falling short of the [Denver] Art Association’s ultimate objective—a spacious museum on the new Civic Center—Chappell House was an invaluable asset, the DAM’s first real home. In 1923, the Denver Art Association became the Denver Art Museum. It began a long journey, not only to secure its coveted place on the Civic Center, but also to become the official “art arm” of the City and County of Denver. In the next section of his thirty-seven-(large)-page essay on “The Denver Artists Guild: Its Founding, Activities, and Legacy,” Cuba describes the work of the guild and its members through the First World War and the explosion of unconventional modes of artistic expression, the Great Depression, and World War II. He describes the locations where the work of many members during this time, in murals, sculpture, and paintings, can still be seen—from the State Capitol to the Civic Center, and to restorations of commercial buildings like the newly remodeled former Colorado National Bank Building complete with its original murals. Also he talks of the many art projects executed under the aegis of the federal government during the Depression era, in post offices and other public buildings. As the guild’s vice president and program chairman, Sanderson was experiencing the group’s “underlying conservatism and some members’ disdain for modern art.” Along with Sanderson, four other members seceded from the guild to [form] a new group, Fifteen Colorado Artists, which was composed mainly of faculty members from Denver University’s School of Art. Over the years, the animosity between [the Denver Artists] Guild and the Fifteen Colorado Artists softened. The guild began to feature guest artists in its annual shows whose work was far less conservative than that of most of the guild members. And in 1963, William Sanderson was invited to be one of the jurors for the guild’s annual exhibition. It was something of a shock to read the first words of Cuba’s final paragraph in this section of the book: “Although all of the organization’s founding members are deceased . . .” A shock because I personally knew a number of those members, so this statement is quite a reminder that I have indeed “grown old”! Want to learn more? You can buy the book here. Did you know we publish books?